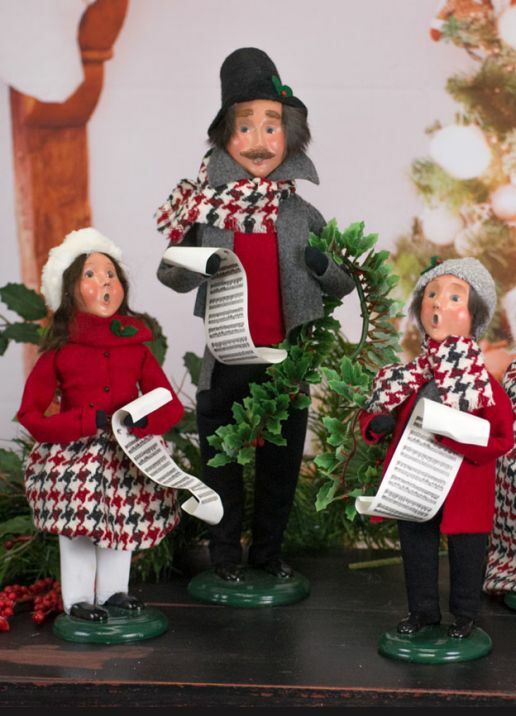 Byers' Choice famous Christmas Caroler figurines! We offer the full collection of these quality, handmade figurines for Christmas. Many have an emotional attachment to this beautiful line, and tell us that when they take their Carolers out during the holidays, it's like having an old friend come to visit. The Byers’ Choice Caroler figurines are widely collected throughout the United States and beyond. They are treasured not only as collectibles but for the way they represent a simpler time and way of life. Since 1986, Byers' Choice Caroler figurines have had a green felt ring and dated gold seal on the bottom of each base. Each figurine is also signed by a Byers' Choice artisan. 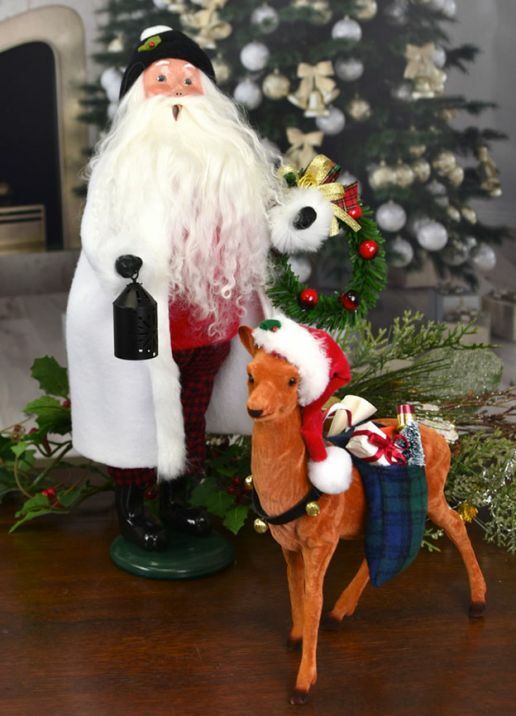 Below are just some of the beautiful Carolers and figurines we have in our store right now, and a Byers' Choice product catalog if you'd like to place an order for something we don't have on hand. Please let us know if there's a product you're looking for and we'll do our best to get it for you as soon as possible! Below is just a small sample of our 2018 Byer's Choice offerings. To see much more, visit us! Finding that perfect Caroler® and bringing it home is only half the fun! Displaying and getting the most satisfaction from your collection is the real enjoyment. We receive many requests for decorating ideas and tips on caring for the Caroler figurines. The following gallery of images will guide you in recreating those beautiful displays that you see at your favorite retail store and enable you to enjoy your collection for years to come! A trick to bring Carolers to life is to bend them into realistic positions. The only sensitive areas are where the head and feet meet the wire armature. Otherwise the bodies and arms have been designed to be fully bendable. When creating a Caroler display, it helps to take into consideration their heights, costume colors and characters to help tell a story with the display. Most like to position them as if they're gathering and interacting with one another. Attaching Carolers to garland on top of doorways; clustering them on top of mantels with greenery, pine cones, and ribbon; or nestling a few of them into evergreen swags or wreaths. A hallway table or nightstand is the perfect place to add a touch of holiday spirit with a simple Caroler display. Another idea is to use Carolers to decorate your Christmas tree. You can decorate the tree just using Carolers, ribbons, garland, and bows to help embellish the display. Artificial trees and wreaths work well because you can use the wired branches to wrap around and hold the Carolers in place. If you put a candle in your window at Christmas, adding a Caroler and some greenery can make a warm and wonderful window display. Use Carolers as the focal point for a centerpiece on the holiday table. Place a wreath in the center of the table and position the Carolers in the middle of the wreath keeping in mind that they should relate to each other or tell a story. You can spray artificial snow on the wreath and weave festive ribbons through the arrangement. Remember that, as the centerpiece it will be viewed from all sides, you should position the Carolers facing out in all directions so that everyone can see them. For those who might like to incorporate a family heirloom, you can use platters, plates, bowls, or candle holders to enhance your display. A few branches of evergreens and holly placed around the figures and tied with flowing red ribbons that cascade onto the table will surely help create that wonderful Christmas spirit. Properly cleaning and storing your Caroler collection will keep it in tip-top shape for years to come! If you love having your Carolers on display for friends and family to enjoy, your figurines will need to be freshened up from time to time. A lint brush or the small attachment for the vacuum cleaner can help to remove loose fur or dust from clothes. To dust the faces, try a small cosmetic brush and clean gently. If your figurine’s hair becomes too frizzy, spray lightly with a little hair spray. If a skirt gets wrinkled or a jacket gets mussed while packed away, use a hand-held clothes steamer to ease out the wrinkles. Avoid damp areas when storing your Carolers — no basements or attics. High humidity can cause metal parts to rust or mold to grow on some fabrics. Blot away any excess water if your Caroler should happen to get wet, and dry with a blow dryer on the lowest setting. If your Caroler comes in a clear plastic sleeve/bag, you can store it in this bag to keep the dust away. However, do not close/seal the bag airtight. It’s a good idea to keep your Carolers safely stored well out of reach of any inquisitive pets. Cats and dogs have been known to be attracted to some of the materials in the Carolers and to chew them up. Mice are also attracted to the Carolers, and find that their tissue paper bodies make great materials for nest building. If you wrap your Carolers in tissue paper, adding a few mothballs to the packing box will keep these rodents away. Avoid storing your Carolers in cedar, as the wood has been known to dissolve the paint on Carolers’ faces. Finally, avoid displaying them in bright sunlight. Prolonged exposure will fade the clothing and face paint. It’s important to store the Caroler figurines in a standing position. The house boxes and Caroler Condo storage box are perfect for this. The Caroler Condo has partitions which keep the Carolers from bumping into one another. Crushed paper can be placed under skirts to help them hold their shape, but wrapping them in paper may crush the fabric. If a hat brim gets crushed, carefully manipulate the felt or gently iron. A tidy little home for your Carolers! Safely store your collection until the next time you put it on display. Stores 12 Caroler figurines; made of sturdy cardboard with protective vinyl cover. Display Risers are a great way to show off your Carolers. Each kit comes with 3 raised platforms and enough artificial holly to make your Caroler grouping really festive. Some assembly required. 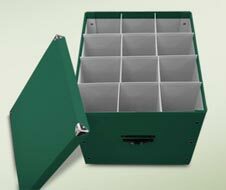 The perfect presentation box when giving a Caroler as a gift. The box is made of vinyl-covered, sturdy cardboard. This kit contains small bottles of black, green and flesh paints to help with minor repairs/scratches/chips.